Independent Goldsmiths JEWELRY REPAIR Place plus CUSTOM JEWELRY MAKING has an experienced Goldsmith / JEWELRY MAKER. We perform JEWELRY REPAIR and CUSTOM JEWELRY MAKING on site. JEWELRY REPAIR is always done fairly priced and quickly returned. We are the JEWELRY REPAIR headquarters in =RAPID CITY! It is our belief that there are not many JEWELERS who have as much JEWELRY REPAIR experience in RAPID CITY. We do not send your JEWELRY REPAIR off to some far away place for repairs. Chuck has been in Business for 20 years, he has over 30 years experience. 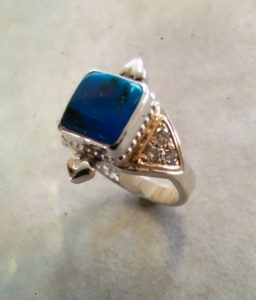 We can get your JEWELRY REPAIR job done on site, yet we do sometimes collaborate with other RAPID CITY JEWELER Artisans in order to achieve the best results for the client. Services available include RING SIZING , Ring REPAIR, DIAMOND replacement & prong repair, EARRING REPAIR, Necklace REPAIR and any other JEWELRY REPAIR possibly IMAGINABLE! We JEWELRY REPAIR just about anything JEWELRY related, from costume JEWELRY to the finest heirloom quality JEWELRY pieces. Plus, we perform CUSTOM JEWELRY MAKING, Stone Setting and customization of existing JEWELRY pieces. We work with the JEWELRY DESIGNER (you) to bring the JEWELRY DESIGNER’s idea to life. We have a professional RAPID CITY JEWELER who is capable of working in Gold, Silver, Platinum and a variety of other materials. Chuck has literally completed JEWELRY REPAIR numbering in the tens of thousands and made CUSTOM JEWELRY pieces numbering in the thousands. 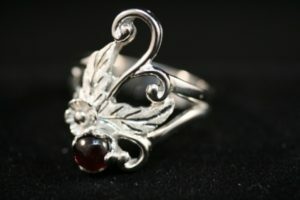 Chuck is one of the more experienced JEWELRY MAKERS in RAPID CITY=. He is considered by many to currently be among the most experienced JEWELRY REPAIRMEN in the area. He takes pride in the quality of his craftsmanship, even for the smallest of repairs. You will talk directly with the JEWELRY MAKER about your project. Don’t let a store send your work off to some far away place where YOU and sometimes, even THEY have ABSOLUTLY no idea who will be completing the work. Why should your JEWELRY get more frequent flyer miles than you? That’s just RIDICULOUS, It should not! Bring it to a RAPID CITY JEWELER instead. Typical Hours: 9:30am till 5:00pm M-F.
We often close for lunch between 12:30 and1:30. Saturday usually open from at least 10:am till 1:00pm. Rapid City is a regional center for commerce so we have out of town regulars stop for jewelry repair, ring sizing and jewelry customization from all over the area while they are in town visiting. Us Jewelers are a bit of a dying breed so many towns don’t have a Jeweler anymore. It is always a pleasure to see friends/clients from far and wide, like the Southern Hills Clients from Custer and Hill City, Hot Springs, Pringle & Edgemont. In Newcastle Wy. and on over to Lance Creek & Fort Larimie. The Chadron and Rushville and other Nebraskans are great to have in the Jewelry Repair and Custom Jewelry Shop. As are the Clients that stop in at our Rapid City Jewelry Repair Place + Custom Jewelry from Pine Ridge, Buffalo Gap, Hermosa, Wall and Phillip, and lets not forget our friends from New Underwood, Box Elder and EAFB that call us thier Jeweler in Rapid City ….Our Rapid City Jeweler welcomes people from Faith, Newell, Belle Fourche and Sturgis. Regulars come from Gillette, Sundance & Spearfish plus the Lead / Deadwood area and Galena. From Baker & Bowman to Cheyenne & Denver we’ve been here to help. Last but certainly not least, The Pleasant & Piedmont Valleys from Black Hills National to Black Hawk. My apologies if your town isn’t on the page, let me know and I’ll be darn sure to add it. Thanks Again to all, wherever it is that you hail from! This Site sponsored by www.FastRingSizing.com. We’re Featured at www.RingSizeFast.com & www.SizeRingFast.com. CAN DO ATTITUDE FOUND HERE! We like to help people accomplish their jewelry projects. If you've been told No we can't do that, with regard to a jewelry repair or custom jewelry project, Give us a try. Working in Gold, Silver,Platinum and other materials. We like to say We can do that!